The Neptune is considered as well as the Two Towers a symbol of Bologna. Built in marble and bronze it stand in Neptune’s square, the fountain dates back to 1566 and was commissioned by Pier Donato Cesi in honour of the pontifical government. Its symbolism is very clear, from above god of sea rules on the waters and so does the pope on the world. There are many curiosities about this statue. For example: few people know that Maserati was inspired by statue for the realization of its logo. 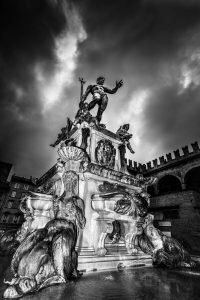 The Neptune’s fountain is also the subject of a metropolitan legend, the seven secrets of Bologna. To unravel this secret, one should look at the statue from a certain perspective but at the moment the fountain, being restored, is surrounded by a scaffold that does not allow it to be admired in its entirety. Luckily the restoration of the fountain will not prevent you from visiting the Neptune! The scaffold for restoration is usable to reach the statue and see it closer than it ever was possible.